As you may have already noticed, we’re right in the midst of Open Day season! If you’ve ever thought that going to an Open Day may not be worth your while when you’re thinking about applying to uni, then you should really stop and think of the many benefits that come from attending! Our #CovOpenDay is always a great way to explore the campus – including a unique blend of modern and historic buildings, our fantastic faculties, and seeing the amazing hands-on facilities in action. You can join in on our campus and accommodation tours, check out the information fair, drop in and see a mini presentation around University life, or just take some time out to relax in the campus surroundings. It’s also a fantastic opportunity to meet current academics, staff, and students, and get any burning questions off your chest. See, I told you there are many! So, now we know why you should be attending, it’s time to find out just what type of attendee you will be! Check out our quiz below, it’s a bit of fun! And we look forward to seeing you at our next Open Day! 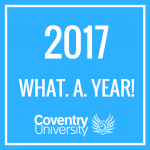 #Trending, Confused, Excited, Explore The City, Get Involved!, Happy, Inspired, Join Us, Mature Students, Postgrad, Student Life, Undergrad, Why Cov Uni?